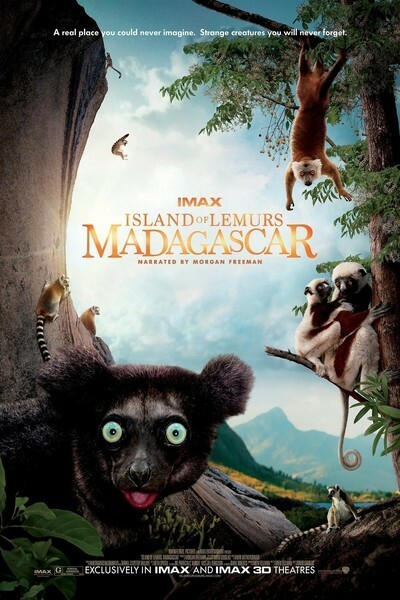 While following a comfortable and familiar formula, “Island of Lemurs: Madagascar” accomplishes a great deal in its 40-minute running time, entertaining and educating us while delivering a message about preservation that’s clear without being heavy-handed. Director and cinematographer David Douglas, who previously shot the 2011 IMAX 3-D documentary “Born to Be Wild” about orangutans and elephants, offers breathtaking aerial footage of vast, green forests and severe, majestic rock formations. But you (and your kids) are here to see the plucky, furry creatures who inhabit these spectacular, remote places. And boy, do they deliver. There’s something simultaneously charming and haunting about these lean and agile primates—a playfulness to their demeanor but an intensity to their eyes. They stare directly at us, undaunted, but it feels as if they can look right through us. They also leave a powerful impression on the ears. One sequence in the film features several lemurs clinging to trees and calling out to each other in shrill, high-pitched tones. Individually, the sound is cacophonous, but a forest full of them making this noise plays like an anxious symphony. Along those lines, Mark Mothersbaugh’s score is suitably lighthearted but sometimes a tad intrusive when natural sound might have been more effective. And the use of a cover of The Ronettes’ “Be My Baby” as a couple of lemurs meet for the first time (with the hope that they’ll eventually mate) is cringe-inducingly on the nose. But these are minor quibbles in a movie that solidly fulfills its purpose. Morgan Freeman narrates the film (of course), his voice rich with both amusement and gravitas. And what he’s been given to read is mercifully free of cloying anthropomorphism. No cutesy names, backstories or emotions have been assigned to these creatures, as is so often the case in family-friendly nature documentaries. The lemurs’ actions more than speak for themselves, and their faces are so expressive that we can’t help but connect with them. As the lore goes, an early form of lemur floated on a raft of vegetation across the Indian Ocean from Africa to a remote island 60 million years ago. Since then, hundreds of species have developed throughout Madagascar, many of which are now endangered. Douglas wisely recognizes that the images of these animals will capture our hearts, but just as inspiring is the work of American primatologist Dr. Patricia C. Wright. She’s dedicated her time and research to preserving these creatures at Ranomafana National Park—but it gets harder and harder to find lemurs and protect them when so much of their rainforest home has been burned and cleared to make room for farming. Children in the audience may not be able to comprehend fully the magnitude of such a dire ecological shift, but the intimacy of the IMAX 3-D format will allow them to feel as if they can reach out and touch these strikingly beautiful animals, and smile, and laugh. And maybe the cute factor will lead to curiosity and—hopefully, ultimately—a greater understanding.